Well, trimming those blocks down was the most difficult thing in the universe. Not only do the points of the nine patches have to end up in the precise middle of each edge of each block, but each block needs to come out at exactly the same size. And they need to be properly square. It has taken me two days of extreme concentration doing a couple at a time, and even so, there has been the odd eighth of an inch squished and stretched but the blocks have all been bullyed to fit into three strips of six and I am ready to cut and sew sashing. 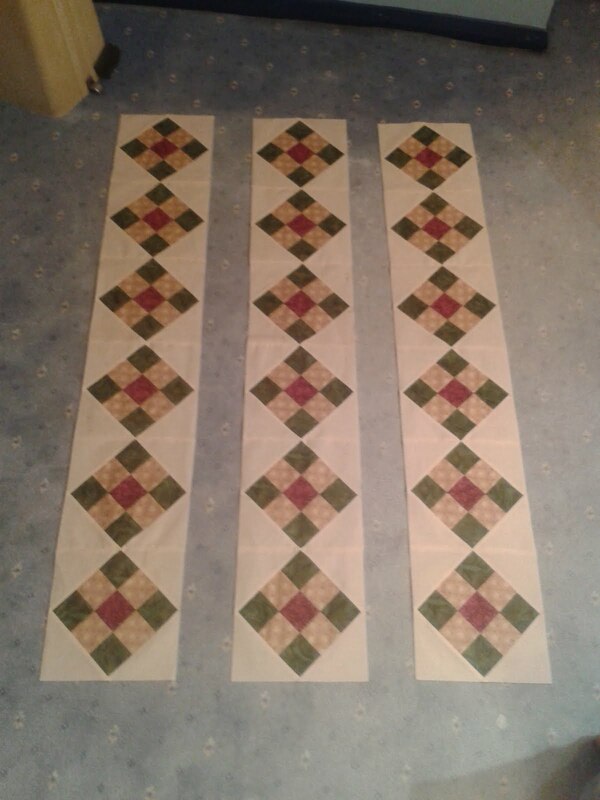 As I'm making the quilt slightly larger than the pattern, I'm going round to mum's shortly to put them in-situ on the bed in order to double check that the extra inch I propose on the sashing won't look odd. And here's the good bit, I'm getting dinner cooked for me too. Hurrah! And I thought I was the only one who knew the Squished/Stretched Method of aligning quilt squares. I guess the book I was planning to write is not to be. Loved your description. Happy quilting! I can hear my mother telling me "Nothing worthwhile comes easily." When you are creating a treasure it's definitely true. Your strips look perfect and beautiful. I love the idea of the easing in of seams being called the "squish'n'stretch" method! It is looking really good though. Enjoy your dinner. It sounds like you've earned it. Ugh...sorry the trimming down was such a struggle, but boy, is that looking great already!! Happy New Year to you, my blogging friend!! They look great, so they must have been worth the struggle right? Thank you for your comments, girls - and (how remiss of me!) of course a very Happy New Year to all! And of course it has turned out to be worth the anguish, but - blimey - I was sweating for a while there!